De Niro’s long since served as an inspiration to Scorsese – it now appears that the paycheck is the actor’s main motivation. He hasn’t worked for the filmmaker since the 1990s, when the former starred in the powerfully creepy remake of “Cape Fear.” In this film, the director tributed classic crime with a modern, more visceral twist. More recently, aside from “The Departed,” Scorsese has returned to the classical style, with “The Aviator” and even “Gangs of New York.” In these tributes, Leonardo DiCaprio has become his new muse. US Marshall Teddy Daniels is out to find a missing person, as does the investigator in the 1973 Hammer Studios-toned film. This high stylization suggests that Scorsese has something up his sleeve. 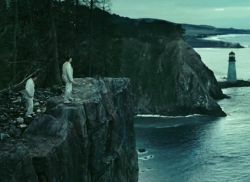 The visual design of the island as Marshall Daniels and cohort Chuck Aule (often badge-wearing Mark Ruffalo) approach looks like something out of a CGI-crafted fantasy, and when the film, during an interrogation scene, shifts the lighting between shots, we see more than just Godardian playful formalism. The point of view is hard to trust; it’s hardly a spoiler to know that this pseudo-reality is really an overblown fantasy, Scotch-taped together into a storyline. Scorsese has never used true surrealism. His closest venture would be “After Hours,” which is really a picaresque one-night journey reaching the bizarre. The filmmaker’s work is too grounded in narrative clarity, even if his endings may play with expectation, as does “The Departed’s.” In “Shutter Island,” he wants subjective narrative logic and tosses in multiple perspectives of the same reality, such as one female character taking on many persons. Too often these multiples conflict and work against Scorsese’s investigation-based structure. Repeated dream sequences serve as red herrings, to suggest that the realism is merely disrupted by brief interludes into our main character’s head. Scorsese uses the tone for some creepy effect, with a sure handed style of suspense from yore (look out for a “Spellbound” ref and a nod to “Double Indemnity” near the end). But the film remains a stale realism-is-really-fantasy trick, and the tone can’t save the narrative falling out. Posted in Film Reviews, Side Shots Film Blog and tagged Martin Scorsese. Bookmark the permalink. Trackbacks are closed, but you can post a comment.